Students will be able to identify the inner planets. 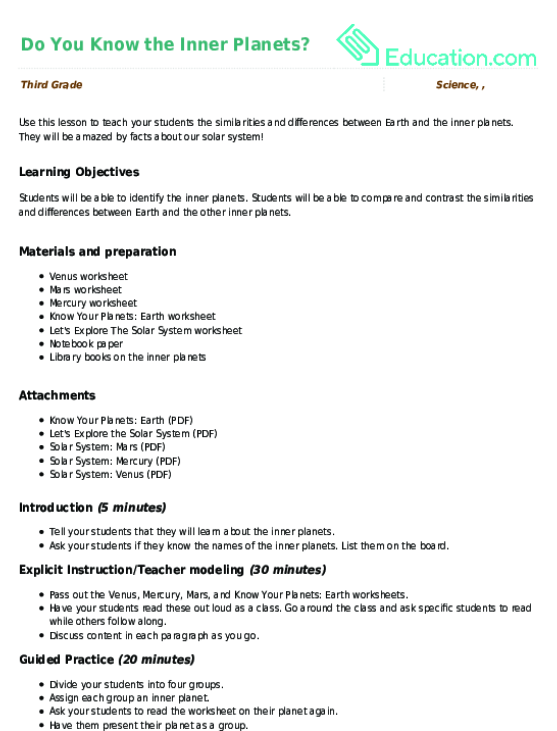 Students will be able to compare and contrast the similarities and differences between Earth and the other inner planets. Tell your students that they will learn about the inner planets. Ask your students if they know the names of the inner planets. List them on the board. 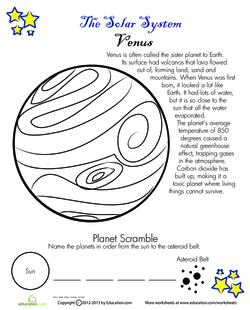 Pass out the Venus, Mercury, Mars, and Know Your Planets: Earth worksheets. 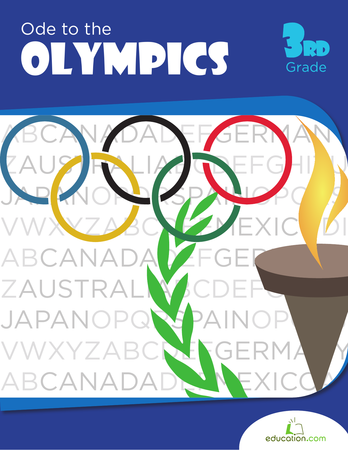 Have your students read these out loud as a class. Go around the class and ask specific students to read while others follow along. Discuss content in each paragraph as you go. Divide your students into four groups. Assign each group an inner planet. 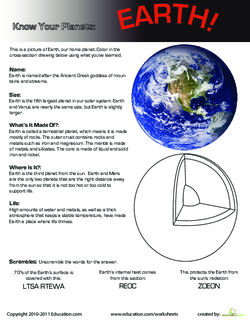 Ask your students to read the worksheet on their planet again. Have them present their planet as a group. Ask your students to create three Venn diagrams on a sheet of paper. Instruct them to compare and contrast Mercury and Earth in the first one, Venus and Earth in the second one, and Earth and Mars in the third one. Ask your students to use their worksheets from explicit instruction to fill in the Venn diagrams. 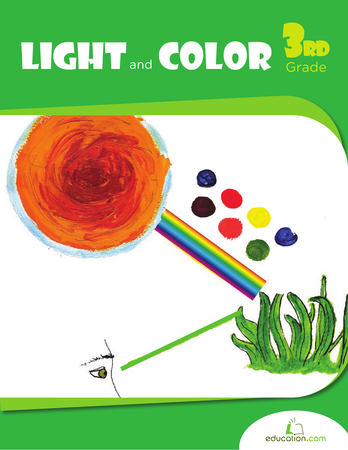 Enrichment: Ask your students to go to the library and read a book about any one inner planet (except Earth). Have them write five fun facts about the planet. Ask your students to use at least two books to find the facts. Support: Ask your students to draw the four inner planets. 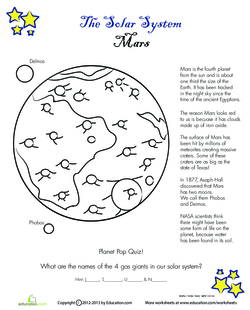 Have them use their planet worksheets from explicit instruction to write facts about each planet next to the drawing. Conduct a short five question quiz on the inner planets. Potential questions include: What are the names of the four inner planets? Why does Mars look red? Which planet is called the sister planet to Earth? Which planet is closest to the sun? Which planet has high amounts of water and metals? 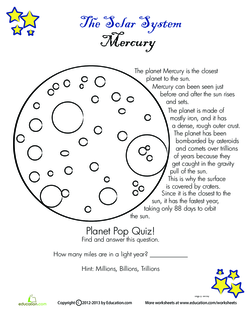 Ask your students to complete the Let's Explore the Solar System worksheet. 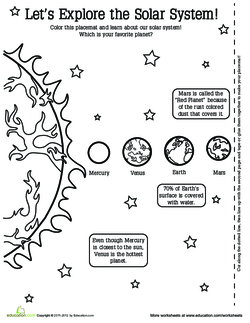 Have them write a fact that they learned about each planet next to it on the worksheet. 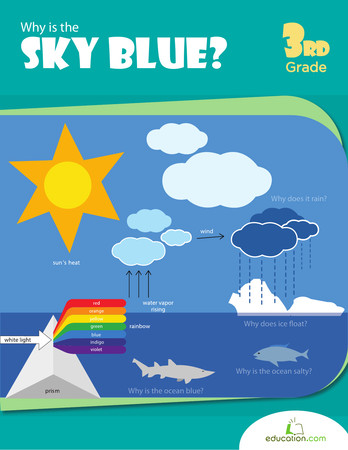 Use this resource to track what your student knows (K), wants to know (W), and learned (L) about a nonfiction topic. In this lesson, you will read the heartwarming story of Bun Bun Button by Patricia Polacco to your class.